Q. How is it possible for debt funds to give high returns when they are holding bonds which give them fixed returns of 8-10%? Home > Direct Mutual Funds > Q. 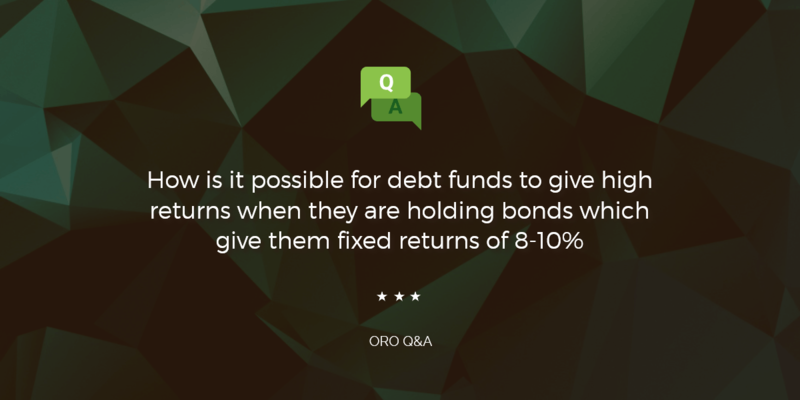 How is it possible for debt funds to give high returns when they are holding bonds which give them fixed returns of 8-10%? 1. Regular interest income: Every bond has a coupon rate (which is a % of its face value) so say 8%. Coupon rate* Face value of the bond reflects the regular interest that the bond will pay you every year/every 6 months (depending on the terms.) If you hold a bond to maturity then this is the only income you will get. 2. Capital gains/loss: This is the gain (loss) that you make if market interest rates go down (up) relative to the interest rate at which you bought the bond. Say, you bought a bond which was paying 8% interest on the amount you paid for it. Now the market interest rate has become 6%. Automatically your bond has become more valuable and the price goes up to reflect that. Similarly when if the market interest becomes higher than 8%, the bond price will fall. The sensitivity of bond prices to interest rate movements depends on their time to maturity: more the time to maturity, more sensitive is the bond price. Now when we come to the different types of debt funds, these are usually classified according to the average maturity of bonds they are holding. So, on the one hand, you have liquid funds which invest in securities whose remain maturity is less than 91days while the other end of the spectrum you have a long-term bond fund which may hold bonds with 7-10 years to maturity. Just like the underlying bonds they hold these debt funds also have two sources of returns. First is the regular interest income. However since debt funds are perpetually holding bonds (i.e. once the bonds mature or are no longer in the mandate of the debt fund, they will sell these bonds and buy new ones), therefore the regular interest income of the bond fund should be very close to the average market interest rate prevailing in the markets for that maturity. This component is more or less fixed and is known in advance. Second is the capital gain component. Capital gains component is almost negligible for liquid funds which hold instruments with very little time to maturity but becomes progressively more important as we go into debt fund categories which have more time to maturity, such as medium and long-term debt funds. These are the categories where you are likely to see double-digit returns if interest rates come down. The downside is that debt funds with a long time to maturity can also give negative returns if interest rates go up.